At Pine Creek Homes, it is our goal to provide the most stress free environment for building your dream home, cottage or addition/renovation. With personalized service from the owners of Pine Creek, you can be confident that your project will be built with expert craftsmanship and attention to detail. Pine Creek specializes in taking care of the details involved with the entirety of your project, such as making sure all building codes are adhered to with exact scrutiny. We want you to be excited and relaxed as you enjoy picking out the fixtures and finishes which will transform your house into a home. You are not just another customer to us. We want you to feel comfortable, involved and a part of the entire process from start to finish. Whether it is deciding between two faucets, an update on the status of your build, or any general questions, we are always here for you. We encourage site visits at every stage of the build so that you can see your project take shape and ensure that you are completely satisfied with how it is coming along. We want you to be just as excited about your new home as we are to build it for you! Whether you are building a conventional home or have chosen to build a timber frame, the options for interior and exterior finishes are the same. The main difference between the two, other than the look, is the way each is constructed. While a conventional home is built starting with the outside walls and working in, timber frame homes are built in the opposite manner. 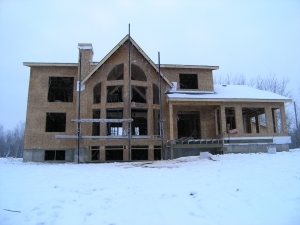 The main structure of the timber frame is put up first, then the wall and roof finishes (drywall or wood) are installed on the outside of the frame. After this, 2×6 construction is used on the wall sections and specialized trusses are used on the roof sections. This allows us to run all electrical in the walls and roof before we close it in with the exterior wall finishes. Timber frame homes have the same insulation and energy efficiency of a conventional home, just the look and feel is different. Building a home should be a stress free and rewarding process, so relax and know that your project is in our very capable hands. While Pine Creek Homes would love to build your home from start to finish, some customers wish to do the finishing themselves. For this we would recommend the â€œframe and shell option. In this option we would bring your project to the point where it is all framed, roofed, and completed with soffits and facia, therefore being protected from the elements. This allows you, the home owner, to finish the inside on your own. This option is especially attractive to cottage owners. It is more cost effective at the onset and it is a very flexible alternative; you can do as much of the work (or as little! ), as you want. Although the frame and shell option is not for everyone, it’s just another way that Pine Creek Homes gives a completely custom experience.